South Street is a Low Rent Public Housing Development operated by the Boston Housing Authority. The property consists of 132 rentals that range in size from 1 - 4 bedrooms. The community is located on South Street near the Agassiz Community and School Gardens. They offer an annual family outdoor picnic and weekly Hotdog cookouts during the summer. These rentals are income based and the eligibility guidelines are set by HUD. There may be waiting lists for these rentals and at times the lists may close to new applicants based on the size of and length of wait on the lists. If you are interested in renting at South Street please contact the directly to obtain more information about eligibility requirements, availability of rentals, the status of any waiting lists and their application procedures. 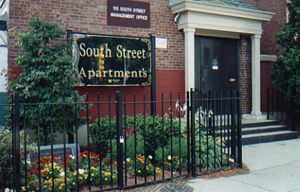 Are you familiar with South Street Boston Low Rent Public Housing Apartments? Help PublicHousing.com users find out answers.